﻿ Chicago Hispanic Newspaper, Lawndale News, Hispanic Bilingual Newspapers, Su Noticiero Bilingue » The Romans in Nova Scotia? April 20, 2019 8:00 am You are here:Home Commentary The Romans in Nova Scotia? The Romans in Nova Scotia? Posted by Editor on December 24, 2015 in Commentary | Comments Off on The Romans in Nova Scotia? It has been in the news. A man named J. Hutton Pulitzer claims that a lady, whose grandfather found a Roman sword off the coast of Nova Scotia in 1901, may have come from a Roman ship that may have sunk off the coast of Nova Scotia an estimated 1,500 years ago. Pulitzer further claims that the Roman ship remains undisturbed at the bottom of Oak Island, and intends to find it. Well, there are a whole list of questions about this. 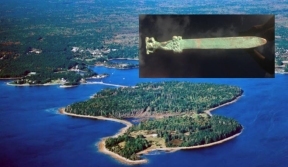 First, did the family in question really find the Roman sword off the coast off Oak Island near the Canadian province of Nova Scotia? Second, is there really a “Roman” ship at the bottom of the sea off Oak Island? Could it be a, for example, a Viking ship that may have captured a Roman sword from an enemy and some Viking’s family may have held on to that sword for a couple of generations before the sword and maybe Viking ship went down? We do know that the Vikings did ply the waters off Nova Scotia. Could the sunken ship be a Viking one? Here’s the thing. We simply do not know. Did the Romans ever come close to this continent? One or a few people saying it was so is one thing, but physical evidence is quite another. We know that the Vikings DID come to the continent because we have the archeological evidence for it. In the 1960’s, Norwegian husband and wife Helge Ingstad and Anne Ingstad excavated several mounds at a place called L’Anse aux Meadows to discover that they were originally Viking sod houses. The archeological evidence was more than convincing that indeed Vikings did come to the Americas and did settle in part of the Americas for a very short time. This work took years, and the Ingstad’s had to prove to historians and archeologists that indeed the Vikings had come to North America. Only the physical evidence has shown that the Vikings did come to North America 500 years before Christopher Columbus. Now, for Pulitzer to prove that the Romans came to the Americas 1,500 years before Columbus, and even before the Vikings, he would have to dredge more than a Roman ship to prove this was true. If the Romans had come to the Americas, wouldn’t there be more than one sunken ship? Couldn’t there be archeological remains of Romans on the continent? This is all saying maybe, but only physical evidence will rewrite the history books. Until there is truly hard and verifiable evidence of the Romans in the Americas turning up anytime soon, we must for now just consider this little more than conjecture.